The month of November 2017 has been declared a month of Grace and Peace multiplied by God Almighty through The Angel of His Church as inspired by the Holy Spirit. The meaning of grace: The meaning of the word grace (Chen in Hebrew and Charis in Greek) as used in the Scriptures, literally means ‘favour’ to bend or stoop in kindness to another as a superior to an inferior. John 1:14 ‘And the word was made flesh, and dwelt among us and we beheld his glory, the glory as of the only begotten of the Father, full of grace and truth’. God’s grace has been termed ‘unmerited favour’ but it is more than an attitude of favour or mercy, that’s why the Bible makes us to understand in Ephesians 2:7-9 ‘For by grace are we saved through faith, and that not of yourselves, it is the gift of God. Not by works, lest any man should boast’. King David was a very good example of someone that enjoyed the grace of God abundantly. May we not be rejected in Jesus name. May our heads not reject the grace of God in Jesus name. May heaven remember you on your day of showing (coronation, promotion) in Jesus Mighty name. The meaning of the word Peace: The Hebrew word for peace is shalom which means soundness in health & well-being. Absence of war, (peace from enemies) peace is not the absence of challenges, that’s why the Bible says in Philippians 4:7 ‘And the peace of God, which passeth all understanding, shall keep your hearts and minds through Christ Jesus’. Isaiah 26:3 ‘You will keep in perfect peace, whose mind is stayed on thee, because he trusteth in thee’. The Psalmist said in Psalm 16:8 ‘I have set the Lord always before me, because he is at my right hand, I shall not be moved’. Micah 7:8 ‘Rejoice not against me, O mine enemy, when I fall, I shall arise, when I sit in darkness, the Lord shall be a light unto me’. A very good example of someone who enjoyed the peace and rest of God was King Solomon the son of King David. 1 Chronicles: 22:9 ‘Behold, a son shall be born to thee, who shall be a man of rest, and I will give him rest from all his enemies round about, for his name shall be Solomon, and I will give peace and quietness unto Israel in his days’. 1 Kings 5:4 Solomon speaking here: ‘But now the Lord my God hath given me rest on every side, so that there is neither adversary nor evil occurrent’. King David his Father was a man of war, but King Solomon did not fight a single war during his reign over Israel, he enjoyed the peace and rest of God. No wonder he was the one God chose to build a temple for Him. God did not allow his Father to build His temple because he said his hands were soiled with blood. The word multiply means ‘To increase or cause to increase greatly in number or quantity’. Isn’t it just what we need right now, a bath in God’s grace and peace? He wants for us to begin to walk in another realm of his Glory as touching His grace and peace, and so shall it be in Jesus name. God’s grace and peace is available to you and me. The more we know God, the more familiar we are with His promises, the more our thinking is shaped and saturated by the words of our Lord Jesus, and the more grace and peace will be multiplied to us. The word of God contains the source of the grace and peace we need. Jesus intends for his words to abide in us, because they are words of life (spirit and life). Apostle Peter in 2 Peter 1:2 said ‘Grace and peace be multiplied unto you through the knowledge of God and of Jesus our Lord’. 1) God is the only source of Grace and peace and it is to be experienced: If we stand in the unshakeable grace of God (Romans 5:2) and if we are reconciled to God in unchangeable peace (Romans 5:1) then what is multiplied to us is an increased and deepened experience of grace and peace. 2) Grace and peace vary in measure in our lives: Grace and peace are not static; they go up and down in our lives. Hour by hour, day by day, our enjoyment of grace and peace changes. It ebbs and flows. We need to own it and seek continually to receive, new measures for new moments. 3) There is always more grace and peace to be enjoyed: We always need more grace, more peace. Every day, we need new measures of grace and peace for new moments. In this life we will never be able to say, ‘I have arrived’ I have all the grace and peace I can use. That’s why Apostle Paul said in Philippians 3:10 ‘That I may know you’. Philippians 3:12. The Christian life is not static. It is a life of movement, of moving forward not drawing back. Day by day we are growing in grace and peace in Jesus name. 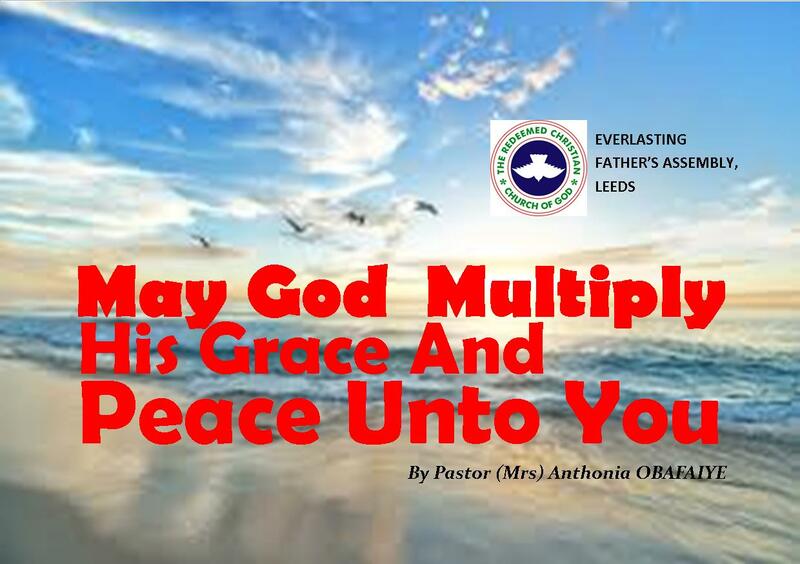 4) Grace and peace are multiplied by God: Grace and peace does not just happen, it comes from God. God gives grace to the humble (1 Peter 5:5). Peace is the fruit of the Holy Spirit (Galatians 5::22). 5) Grace and Peace are multiplied by God through human means: God responds to humility with more grace. Humility is a condition of receiving this grace. Of course, humility itself is the fruit of the Spirit (Galatians 5:23). But the fact that ‘God is at work in you and I to do His good pleasure’ (Philippians 2:13) does not lessen our responsibility to ‘to work out our own salvation’ (Philippians 2:12). The unique thing about a spoken blessing is that is bi-directional. It is addressed to both Man and God. When we say, ‘The Lord bless you and keep you’ (Numbers 6:24), we are asking the Lord to bless you (prayer is a 2 way traffic: we talk to God and we pause to listen to what He has to say to us). So it is with Peter’s words, ‘May Grace and peace be multiplied (by God) to you. God is being addressed and the church is also being addressed (blessed). These words are not spoken in vain, Peter speaks them because he believes they matter, and he believes God answers prayers and we believe that He will multiply His Grace and peace over us in Jesus Mighty name. It is interesting that Paul begins every letter with some form of ‘Grace be to you’ and ends every letter with some form of ‘Grace be with you. To you at the beginning and with you at the end.